In 1951, McArdle described a 30-year-old man who experienced pain followed by weakness and stiffness after exercise. The venous lactate level of this patient failed to increase after ischemic activity. In 1959, myophosphorylase was discovered and was found to be absent in individuals with McArdle disease. The typical features of McArdle disease, or glycogen-storage disease type V, include exercise intolerance with myalgia, early fatigue, muscle stiffness, and cramping, which are all relieved by rest. Following a short period of rest, most patients experience a “second wind” phenomenon and can resume exercise without difficulty. About one half of patients experience rhabdomyolysis and myoglobinuria following vigorous exercise, and some may develop renal failure. Mild proximal muscle weakness occurs in approximately one third of patients and is more common in older patients. A fatal infantile form of McArdle disease, characterized by hypotonia, generalized muscle weakness, and progressive respiratory insufficiency, has been reported. In addition, a late-onset form with no symptoms until the sixth decade of life has been described. See the image below. Enzyme histochemistry of 19-year-old male with McArdle disease. McArdle disease is caused by a deficiency of myophosphorylase (alpha-1,4-glucan orthophosphate glycosyl transferase), which normally initiates glycogen breakdown by removing 1,4-glucosyl groups from glycogen with the release of glucose-1-phosphate. Several tissue-specific isoforms of phosphorylase are noted. Although myophosphorylase is present in cardiac muscle and the brain, it is the only isoform present in skeletal muscle. The liver isoform is deficient in individuals with glycogen-storage disease type VI (Hers disease). Most patients with McArdle disease have undetectable myophosphorylase activity and, thus, are unable to release glucose from glycogen in muscle. Rarely, patients have residual enzyme activity (< 30% of normal). McArdle disease is inherited in an autosomal recessive manner. The frequency is estimated at 1 per 100,000 population. However, only a few hundred cases have been reported. This disorder is probably underdiagnosed because of the mild symptoms in many patients. The early-onset form is extremely rare; only several cases have been reported. The late-onset form is also exceedingly rare. The gene for myophosphorylase (PGYM) is localized on chromosome 11. More than 65 mutations have been identified. Manifesting heterozygotes occur, and synergistic heterozygosity involving this gene may account for muscle symptoms in some heterozygotes. Muscular weakness and fatigue are observed. Tiredness, weakness, and cramping can interfere with normal activity. Some patients can adapt their exercise patterns to take advantage of the “second wind” phenomenon. Fixed proximal weakness occurs in as many as one third of patients. Rhabdomyolysis following vigorous exercise may result in myoglobinuria. As many as one third of patients with myoglobinuria develop acute renal failure. Death is caused by respiratory failure due to severe rapidly progressive muscular weakness. McArdle disease typically presents in the second to third decade of life with limited exercise tolerance. The fatal infantile form manifests in the newborn period. McArdle B. Myopathy due to a defect in muscle glycogen breakdown. Clin Sci. 1951. 10:13-33. Nogales-Gadea G, Consuegra-García I, Rubio JC, Arenas J, Cuadros M, Camara Y, et al. A transcriptomic approach to search for novel phenotypic regulators in McArdle disease. PLoS One. 2012. 7(2):e31718. [Medline]. [Full Text]. García-Benítez S, Fleck SJ, Naclerio F, Martín MA, Lucia A. Resistance (weight lifting) training in an adolescent with McArdle disease. J Child Neurol. 2013 Jun. 28(6):805-8. [Medline]. Rubio J, Gomez-Gallego F, Santiago C, et al. Genotype modulators of clincal severity in McArdle disease. Neuroscience Letters. June 2007. 422:217-222. Lucia A, Ruiz JR, Santalla A, Nogales-Gadea G, Rubio JC, García-Consuegra I, et al. Genotypic and phenotypic features of McArdle disease: insights from the Spanish national registry. J Neurol Neurosurg Psychiatry. 2012 Mar. 83(3):322-8. [Medline]. Nogales-Gadea G, Godfrey RJ, Santalla A, Coll-Cantí J, Pintos-Morell G, Pinós T, et al. Genes and exercise intolerance: Insights from McArdle disease. Physiol Genomics. 2015 Oct 13. physiolgenomics.00076.2015. [Medline]. de Luna N, Brull A, Lucia A, Santalla A, Garatachea N, Martí R, et al. PYGM expression analysis in white blood cells: a complementary tool for diagnosing McArdle disease?. Neuromuscul Disord. 2014 Dec. 24 (12):1079-86. [Medline]. Martinuzzi A, Sartori E, Fanin M, et al. Phenotype modulators in myophosphorylase deficiency. Ann Neurol. 2003 Apr. 53(4):497-502. [Medline]. Lucia A, Nogales-Gadea G, Perez M, et al. McArdle disease: what do neurologists need to know?. Nat Clin Pract Neurol. 2008 Oct. 4(10):568-77. [Medline]. Kazemi-Esfarjani P, Skomorowska E, Jensen TD, Haller RG, Vissing J. A nonischemic forearm exercise test for McArdle disease. Ann Neurol. 2002 Aug. 52(2):153-9. [Medline]. Gamez J, Rubio JC, Martin MA, Fernandez-Cadenas I, Garcia-Arumi E, Andreu AL. Two novel mutations in the muscle glycogen phosphorylase gene in McArdle's disease. Muscle Nerve. 2003 Sep. 28(3):380-2. [Medline]. Vissing J, Haller RG. The effect of oral sucrose on exercise tolerance in patients with McArdle's disease. N Engl J Med. 2003 Dec 25. 349(26):2503-9. [Medline]. Vorgerd M, Zange J, Kley R, Grehl T, Husing A, Jager M. Effect of high-dose creatine therapy on symptoms of exercise intolerance in McArdle disease: double-blind, placebo-controlled crossover study. Arch Neurol. 2002 Jan. 59(1):97-101. [Medline]. Martinuzzi A, Liava A, Trevisi E, et al. Randomized, placebo-controlled, double-blind pilot trial of ramipril in McArdle's disease. Muscle Nerve. 2008 Mar. 37(3):350-7. [Medline]. Andersen ST, Duno M, Schwartz M, Vissing J. Do carriers of PYGM mutations have symptoms of McArdle disease?. Neurology. 2006 Aug 22. 67(4):716-8. [Medline]. Bartram C, Flannery A, Evershed RP, et al. Interrelationships between metabolism of glycogen phosphorylase and pyridoxal phosphate--implications in McArdle’s disease. Advances in Food & Nutrition Research. 1996. 40:135-47. Beynon RJ, Bartram C, Hopkins P, Toescu V, Gibson H, Phoenix J. McArdle's disease: molecular genetics and metabolic consequences of the phenotype. Muscle Nerve. 1995. 3:S18-22. [Medline]. Busch V, Gempel K, Hack A. Treatment of glycogenosis type V with ketogenic diet. Ann Neurol. 2005 Aug. 58(2):341. [Medline]. Busch V, Gempel K, Hack A, Müller K, Vorgerd M, Lochmuller H. Treatment of glycogenosis type V with ketogenic diet. Ann Neurol. 2005 Aug. 58(2):341. [Medline]. Cornelio F, Bresolin N, DiMauro S, Mora M, et al. Congenital myopathy due to phosphorylase deficiency. Neurology. 1983 Oct. 33(10):1383-5. [Medline]. DiMauro S, Andreu AL, Bruno C, Hadjigeorgiou GM. Myophosphorylase deficiency (glycogenosis type V; McArdle’s disease). Curr Mol Med. Mar 2002. 2(2):189-96. DiMauro S, Bresolin N. Phosphorylase deficiency. Myology. 1585-1601. DiMauro S, Hartlage PL. 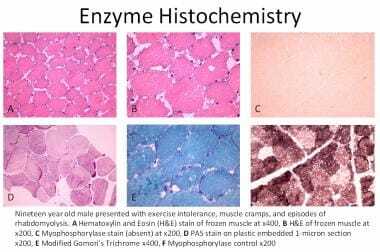 Fatal infantile form of muscle phosphorylase deficiency. Neurology. 1978 Nov. 28(11):1124-9. [Medline]. DiMauro S, Tsujino S. Nonlysosomal Glycogenoses. Myology: Basic and Clinical. 2nd ed. 1994. 1557-1561. Gautron S, Daegelen D, Mennecier F, Dubocq D, Kahn A, Dreyfus JC. Molecular mechanisms of McArdle's disease (muscle glycogen phosphorylase deficiency). RNA and DNA analysis. J Clin Invest. 1987 Jan. 79(1):275-81. [Medline]. Gordon N. Glycogenosis type V or McArdle's disease. Dev Med Child Neurol. 2003 Sep. 45(9):640-4. [Medline]. Grunfeld JP, Ganeval D, Chanard J, Fardeau M, Dreyfus JC. Acute renal failure in McArdle's disease. Report of two cases. N Engl J Med. 1972 Jun 8. 286(23):1237-41. [Medline]. Haller RG, Wyrick P, Taivassalo T, Vissing J. Aerobic conditioning: an effective therapy in McArdle's disease. Ann Neurol. 2006 Jun. 59(6):922-8. [Medline]. McConchie SM, Coakley J, Edwards RH, Beynon RJ. Molecular heterogeneity in McArdle's disease. Biochim Biophys Acta. 1990 Nov 14. 1096(1):26-32. [Medline]. Milstein JM, Herron TM, Haas JE. Fatal infantile muscle phosphorylase deficiency. J Child Neurol. 1989 Jul. 4(3):186-8. [Medline]. Miranda AF, Nette EG, Hartlage PL, DiMauro S. Phosphorylase isoenzymes in normal and myophosphorylase-deficient human heart. Neurology. 1979 Nov. 29(11):1538-41. [Medline]. Moses SW. Muscle glycogenosis. J Inherit Metab Dis. 1990. 13(4):452-65. [Medline]. Nielsen JN, Vissing J, Wojtaszewski JF, Haller RG, Begum N, Richter EA. Decreased insulin action in skeletal muscle from patients with McArdle's disease. Am J Physiol Endocrinol Metab. 2002 Jun. 282(6):E1267-75. [Medline]. Nogales-Gadea G, Arenas J, Andreu AL. Molecular genetics of McArdle's disease. Curr Neurol Neurosci Rep. 2007 Jan. 7(1):84-92. [Medline]. Ollivier K, Hogrel JY, Gomez-Merino D, Romero NB, Laforet P, Eymard B. Exercise tolerance and daily life in McArdle's disease. Muscle Nerve. 2005 May. 31(5):637-41. [Medline]. Pourmand R, Sanders DB, Corwin HM. Late-onset Mcardle's disease with unusual electromyographic findings. Arch Neurol. 1983 Jun. 40(6):374-7. [Medline]. Quinlivan R, Beynon RJ. Pharmacological and nutritional treatment for McArdle's disease (Glycogen Storage Disease type V). Cochrane Database Syst Rev. 2004. (3):CD003458. [Medline]. Schmid R, Mahler R. Chronic progressive myopathy with myoglobinuria: demonstration of a glycogenolytic defect in the muscle. J Clin Invest. 1959 Nov. 38:2044-58. [Medline]. Servidei S, DiMauro S. Disorders of glycogen metabolism of muscle. Neurol Clin. 1989 Feb. 7(1):159-78. [Medline]. Servidei S, Shanske S, Zeviani M, Lebo R, Fletterick R, DiMauro S. McArdle's disease: biochemical and molecular genetic studies. Ann Neurol. 1988 Dec. 24(6):774-81. [Medline]. Tsujino S, Shanske S, DiMauro S. Molecular genetic heterogeneity of myophosphorylase deficiency (McArdle's disease). N Engl J Med. 1993 Jul 22. 329(4):241-5. [Medline]. Tsujino S, Shanske S, Nonaka I, DiMauro S. The molecular genetic basis of myophosphorylase deficiency (McArdle's disease). Muscle Nerve. 1995. 3:S23-7. [Medline]. Disclosure: Received honoraria from Genzyme for speaking and teaching; Received honoraria from Pfizer for speaking and teaching.